1. Where can I find a licensed Proto-II™ installer? Contact us if you are a builder or contractor and would like a list of licensed Proto-II™ installers in your area. 2. How can I become a licensed Proto-II™ installer? Contact us if you are a masonry contractor and are interested in becoming a licensed Proto-II™ installer. 3. 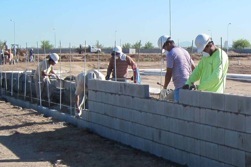 What is the difference between the Proto-II™ Walls and conventional masonry walls? The Proto-II™ Fence and Retaining Walls use the same masonry block and have the same appearance as conventional masonry walls. The difference is on the inside: Conventional masonry walls use rebar and grout for support, while the Proto-II™ Walls use post tensioning. This advanced technology provides a stronger, more efficient design. The Proto-II™ Wall is available in 4”, 6” and 8” wide masonry fencing and also in 8” and 12” wide retaining walls. 4. Who provides the engineering for the Proto-II™ walls? Proto-II™ Wall Systems provides all engineering. Included is the Proto-II™ Standard Product Data Sheet and wet sealed engineering calculations. Custom engineering as required by site conditions is also available.